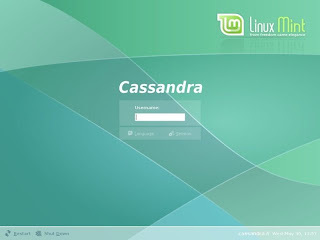 Linux Mint 3.0: A Date with Cassandra - Before my wife gets mad at me, she should read this first: Cassandra is the name of the latest edition of Linux Mint. --It is an Ubuntu-based Linux distribution. Just a little fact, the past versions of Mint have been named Ada, Bianca, Bea, and Barbara. The next release name after Cassandra is Celena, which is currently in beta. If you want to know more and why the girls name, read this interview of the creator of Mint. Cassandra and I got acquainted when a computer from our own disco house business was having some problems. The computer’s OS is Windows XP as it is operated by my brother. My assessment was that the problem is in the hardware so I brought it back to where we bought it and had some parts replaced after copying all the files from the hard drive using a free and open source backup software. Then, it was time to install the OS and test if the hardware is stable enough. The trouble is, I forgot to bring my XP installer. Luckily, I saved an ISO copy of Linux Mint on my iPod. And so I had the chance to test the hardware and at the same time meet Cassandra which then led me to this review of Linux Mint. 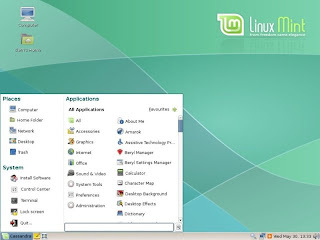 Linux Mint is an Ubuntu-based distribution whose goal is to provide a more complete out-of-the-box experience by including browser plugins, media codecs, support for DVD playback, Java and other components. It is compatible with Ubuntu software repositories. Currently, it is ranked number 6 in Distrowatch.com. You can download Linux Mint Light Edition live CD here. Note: If you want features like MP3, Flash and encrypted DVD to work out-of-the-box, download the Regular or Community Edition (thanks to David for pointing that out). The installation on my system was smooth as silk. It is by far my easiest installation ever of a Linux OS. I think anyone can install it because a simple point and click will do the job. The Ubuntu-like-but-easier installation was finished quickly within 25 minutes and without a single hardware compatibility error. After setting up, everything worked well, from Ethernet to Audio and Video. Only one word comes to my mind when I booted Mint, “elegant”. The artwork is outstanding, like the gorgeously minty boot splash image, login screen, default theme and wallpaper. Its Gnome panel’s SLAB menu has a Cassandra logo. I prefer the classic Gnome menu for its simplicity. To those who are looking for some eye-candy, Mint is pre-installed with Beryl. It doesn’t work on my test machine as I only have an on-board video card. Cassandra is not only beautiful but it has sense of humor. Each time you open a terminal, a new quote or as they call it a “fortune” message will appear on top. Linux Mint 3.0 is loaded with essential applications that worked off the shelf. To name a few, there’s Firefox, Amarok , Thunderbird, Gimp, OpenOffice and more. There’s also an application called Envy that will let you install proprietary ATI driver without difficulty. You can always install additional .mint packages from their software portal using a new feature called MintInstall. Plus, there are plenty of .deb packages available from the Ubuntu repositories. I can say that this distribution is stable enough for daily desktop computing tasks. I have not experienced any trouble while testing several key applications that comes with Mint 3.0 including its multimedia features. I have tested several python scripts I made and they run well. The only problem I encountered was when I tried to activate Beryl which my test machine does not support anyway. All in all, Cassandra (Linux Mint 3.0) has left a mark on me that I’m thinking of someday replacing my wife’s Xubuntu laptop with Mint. It is undoubtedly worthy to be ranked among the top 10 Linux Distro and I will highly recommend it to those who want to try Linux. 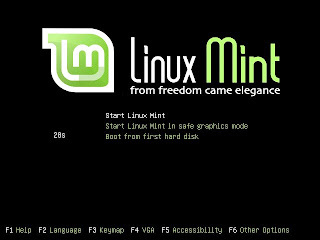 Linux Mint, “from freedom came elegance”. I love their slogan. Thanks for the review. I'm downloading it right now. Although I do appreciate and understand the need for reviews like these, as they should appeal to the Linux know-nothings, but to the more seasoned crowd, this review falls far short of the mark that a professional reviewer would have set. A real review should contain a great deal more detail than this, and should contain actual benchmarks and hardware tests. You did none of that, and so the reader is left wondering about things like wifi support/functionality for common chipsets like Broadcom, Atheros, etc.. Or how about things like USB support for things like external drives, webcams, etc..??? Umm.. Hello? Who gives a crap how "pretty" Mint is if it cant support common hardware?.. Really. Well my friend, first of all, this review is not just intended for more advanced Linux users like you, maybe. This review is summarized and dummyfied to cater Linux and would-be Linux users in all levels. I agree with you that I'm not a professional reviewer but I have given my own honest view and information regarding this distro. JUN is right. In addition, if you are a more seasoned linux user then you can always find a way to know whether those chipsets are supported and how to fix it if it doesn’t work. But ever-increasing hardware devices are already supporting linux or are already supported by linux so it’s not that much of an issue. I feel the strength of the new, popular distros like Mint, as well as Ubuntu and PCLOS, is in their ease of adoption for the novice Linux user. This is a very fast-growing segment right now, and it's about time. The more experienced users don't usually give them much attention, so often cursory reviews like this are sufficient to pique interest enough to try a live cd or install. Plus, since Mint is an offshoot of Ubuntu it's common knowledge that hardware support is top-notch - at least it should be common knowledge for 'the more seasoned crowd'. I can't speak to wireless cards but USB devices work effortlessly. Mint's a great place to start your migration from Windows. It's about as painless as Linux gets, while still having all the power and control the Vets might want. It's more than eye-candy, it's smooth and thorough and flexible and a pleasure to run, on a variety of hardware. Well-said Nimix & Gnome, thanks for your comments. Certainly, you made the right choice Gnome. I forgot to mention the boot time speed of Mint, I think it’s more faster than Ubuntu. I tried installing it on my Xubuntu laptop. It went through everything smoothly until it got to the grub-install. I tried changing the device name (it was using hd0, and for some reason I think it's sd0), but to no avail. I'm not a linux expert at all, although as I was 'raised on DOS' so to speak, I am comfortable with the command line. i have been using Linux mint Bianca for the last three months and I must say it is fairly easy for a newbie. This has all the advantages of ubuntu minus the limitations of non avalaiblity of codecs , restricted drivers,etc which is required to be separately installed in ubuntu by the user.Thus for the newbie it is the most easy distro to install and use. @SM, perhaps this link can help solve your problem. Precisely Arindam, our opinions are alike. Mint is a very good distro. I used to be a "Red Hat / Fedora kind of guy" for quite some time, and before that I used HP-UX a lot (since 1991 in fact...). I switched to Mint on my "main" desktop half a year ago (after some serious trouble with Fedora 7), and I have absolutely no reason look for alternatives. Of course, there might be trouble here+there, also in the Mint, but hey - that's was most distro's offer as an "add-on". I'm still running XP on the laptop, however. Main reason is that wireless WPA-access seems to be so d*mned hard to get running on most (any?) *NIX out there currently. Yes, I know about all the 'chipset' stuff, manual configuration, ndiswrapper etc.etc., but still wishes now and then that some distros will make a real breakthrough in this field. I certainly agree that the review is very good and makes me want to try Mint (I have already), this is IMHO what needs to be done to have more Windoze users shift to (or at least try) any Linux flavor. To Michael: I have had the same problems you describe with WPA support in a laptop from my workplace, I suggest you try SAM Linux or MCN Linux or even PCLinuxOS, they have the best WiFi support I have seen on a LiveCD. Well, I guess the word is out then, huh. I was hoping to keep this gem of a linux distribution all to myself. LOL! a pleasant review for a sweet distro, that's a fact. the only mods that i have made is to change the boot splash and desktop wallpaper to cassandra blue. it would be really good to see linux mint be a pre-installed distro in the future. what, is that gateway calling ? would do 'em some good !! Thank you all for the comments. I’m glad that I’m not the only one who is seeing the potential of this young distro. Cassandra Light Edition you will not be able to play Flash, encrypted DVDs, Windows Media, or even MP3s. This is because the Light Edition is a proprietary software/codec Free version. If you want these features out of the box you will need to download either the Regular or Community Edition. I appreciate the review and I agree Mint is an elegant distribution. I agree with you David. But adding codecs or additional software to Mint is a breeze because it is based in Ubuntu. I love Cassandra and I love this review. I've been using linux for about 8-9 years now, and I still found mint to be one of the nicest 'smoothest' distros I've ever used. Hardware support is magnificent, I am using it on an IBM thinkpad and I've yet to find a piece of hardware that doesn't work. Even my wireless pcmcia card and my usb bluetooth adaptor worked instantly, with no configuration whatsoever. This review is excellent for the non-linux user thinking about trying linux. Don't be too hard on the guy he's not writing for a magazine. My advice is to use the KDE community edition, even though it's a little bigger and requires a DVD it's well worth it. mint is good but as great as pclinuxos. 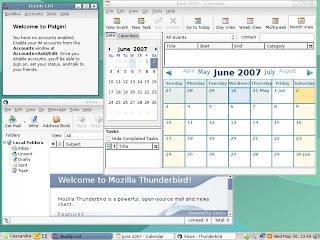 i found pclinuxos 2007 to be the most stable, usable and fast desktop among the linux desktop flavors. New Version of Mint is out as of 9/24/2007. Linux Mint 3.1 Celena. Could you take a look and update your review? Thanks for the info. I'll download the new version today. I must be really lucky. My laptop with Cassandra found the wireless WPA and pretty much set itself up. It was so easy, I forget if there was anything that I needed to do except put in the password.